You may remember the Hollywood movie "Snakes on Plane", but I doubt the inimitable Samuel L. Jackson will be signing on to star in the Thai version.........."Snakes in the Shitter". It transpires that this story has been bouncing around the internet for several years now, but it's only recently that it was brought to my attention. My wife stumbled across it, one evening, whilst browsing the web. What's more frightening than the venomous serpent dangling inches away from your bum-crack is the disgusting state of the toilet bowl. 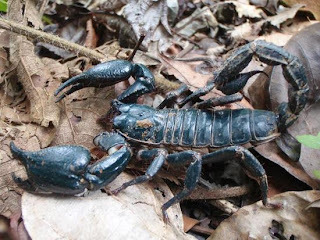 You're more likely to get necrosis in your nut-sacks from the filthy porcelain than from a snake bite!!!! You may think that this is reminiscent of a scene from a horror movie but it's a fairly common experience here in Thailand!!!! 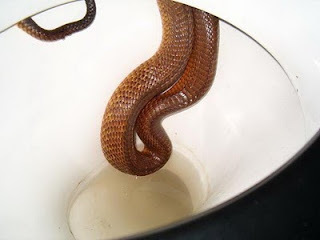 The aptly named blogger "Missadventure" also stumbled across a snake in the toilet on the island of Koh Samet.......for the low-down please click on the link below. And just to show I'm not exaggerating. 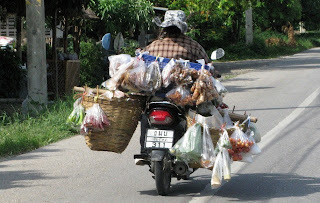 Here is another story from Kanchanaburi province in Western Thailand. I have encountered all manner of critters lurking in the darkest depths of my lavatory including hand-sized spiders, rats and toads but never a snake. Although I'm fond of snakes, the idea of getting envenomated isn't particularly appealing. Since reading this story, every time I sit on the throne, I take the precautionary measure of cupping the crown jewels in my hand until I'm 100% sure there's nothing dangerous down there!!! !